It’s official: P and I are having a love affair with The Center Street Nook. After a hearty “Nook” breakfast last Saturday, we feel the need to return every weekend and simply eat our way through the menu. You will have to excuse my few photos – we were too busy shoveling food into our mouths to get a good picture. You need to brake for this sign and visit The Nook. Why not pick up some beer while you’re there too? The Center Street Nook, or just “The Nook,” is the essence of Jupiter. Do not be fooled by the appearance of the stucco building or the fact that the quaint restaurant shares a wall with a drive-through beer mart. (FYI: I remember riding in the pick-up truck with my dad through the Beer City drive-through. They used handout lollipops to customer’s kids, just like at the bank. It is a wonderful memory.) 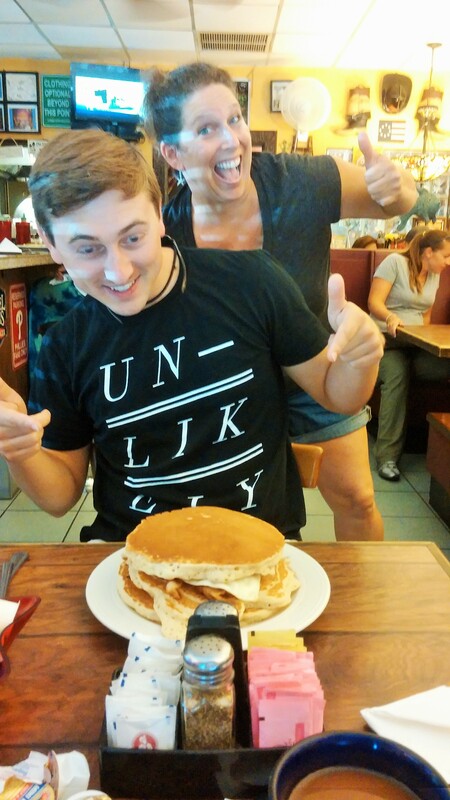 The Nook cooks some serious breakfast food, served by the sweetest waitresses in Palm Beach County. Do not be perturbed by the wait for a table. Even if you get to The Nook “early” by weekend breakfast and brunch standards, there will be a colorful crowd gathered out front. 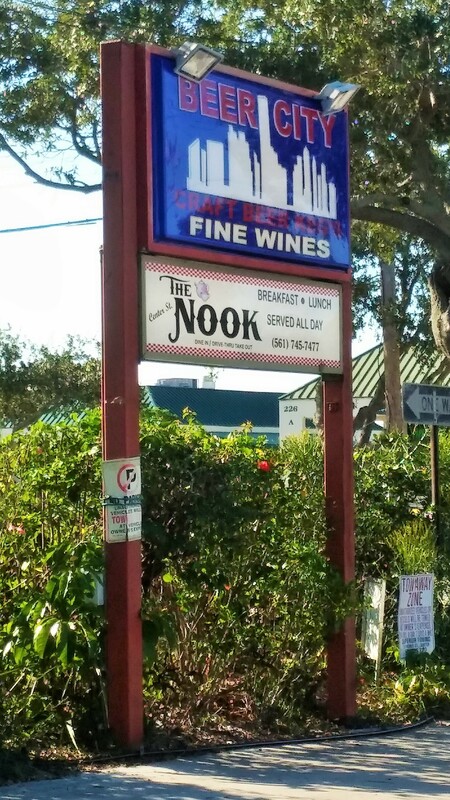 Everyone in Jupiter eats at The Nook, from all walks of life: young couples with children, widowers, surfers, Harley enthusiasts, fishermen. Name any demographic, you can find them nestled in a booth or bellied up to the bar. Lucky for me and P, our wait was short (about 15 minutes) and we quickly found ourselves inside with a breakfast menu at our fingertips. My decision was easy. I ordered a short stack of the Funky Monkey Panky-Dos, true pancakes with chocolate and peanut butter chips and slices of banana baked right into the cake. 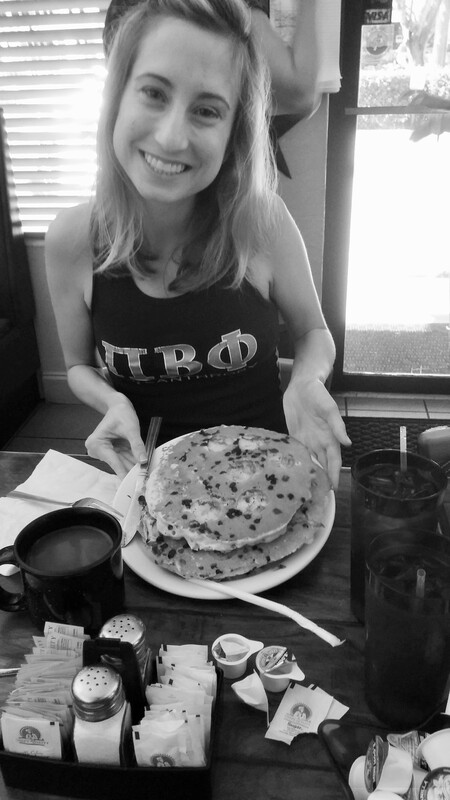 I am not lying, they were bigger than my face. I opted for butter on top instead of syrup, which complemented the banana slices nicely. I have to admit they were not the fluffiest of pancakes but it was so much fun to order (try saying Funky Monkey Panky Dos five times fast) that I quickly forgot about the texture. P ordered the Bill-Dozer, which was a work of art. The Leaning Tower of Piza has nothing on the Bill-Dozer. 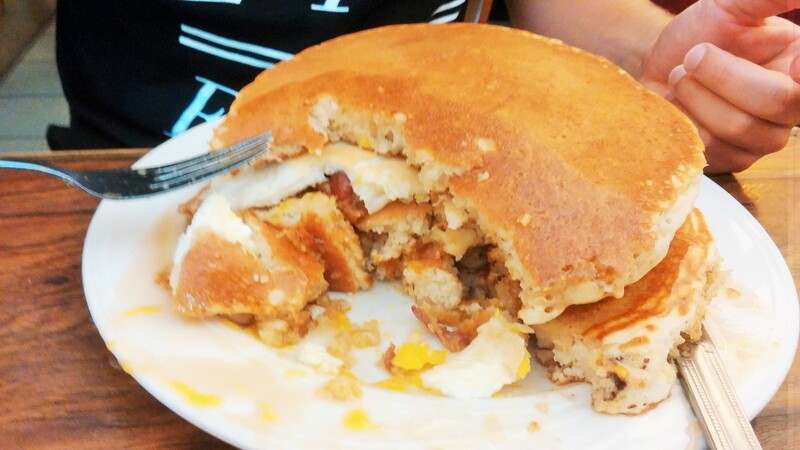 It’s a layered tower of pancake, three sausage links with melted American cheese, a second pancake, two fried eggs with bacon strips, all topped off with a third pancake. The waitresses cheered on P as he cut into it. Needless to say, he was very excited. P and one of the lovely waitresses of The Nook. These ladies make you feel like family. The key to eating the Bill-Dozer is to get all the layers in each bite. 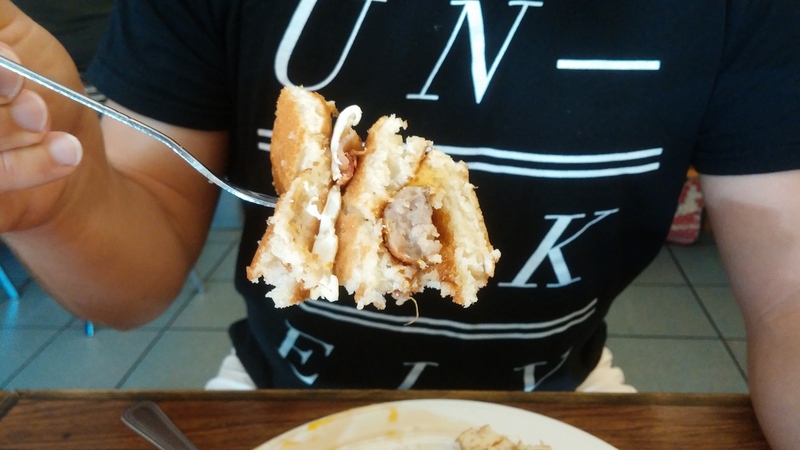 The proper way to eat the Bill-Dozer. P only made it through a third of his meal before he called it quits and asked for a box. The helpings were so large and delicious that we ate our leftovers again for lunch that day and breakfast the next day before church. However, the best part of The Nook is not the food – it is the ladies who work there. When you step into The Nook, it is like stepping into their home. There is no toddler too messy or too cranky, no patron too rude, and no order too hard to handle for these waitresses. Each customer is treated with courtesy and a dose of patience. While P and I ate our breakfast, we noticed that the waitresses knew nearly everyone by name and even remembered birthdays and special occasions. 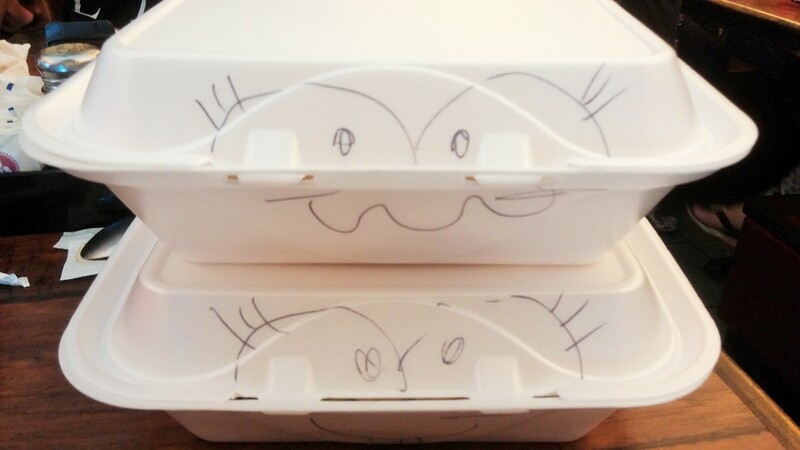 Our doggie bags were packed with care and a smile. 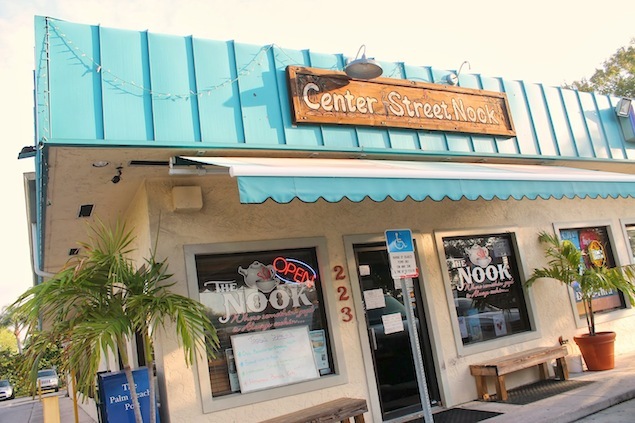 The Center Street Nook is a true Jupiter treasure. Stop on by next weekend… you might just catch me and P trying the next mouthwatering item on the menu. That Bill-Dozer was Un-likely to be eaten in one sitting!!! Trust Me @ JUPGIRL!! !